In my last blog I wrote about quire structure of the parchment, prepared not only for the binder, but crucially for the scribe and the artist to fashion their magic with masterly hand-writing and radiant illustrations and historiated initial letters. Here I give some detail on the writing instruments and inks used during the Medieval and Renaissance periods. Before writing, scribes rubbed the parchment with pumice, cuttlefish or ground chalk to remove any impurities and make the surface smooth and absorbent. They pricked the margins, often through several stacked sheets, and linked the pricks across the page to rule the lines and frame the text space. The ruling instruments varied in different areas and periods. A hard point, stylus or awl was favoured in the early Middle Ages and again during the Renaissance; it produced a shallow furrow and edge effect on the page. A plummet, or metal point often made of silver, was common from the eleventh century onwards; it left a trace resembling a fine pencil mark. Several styluses attached to a handle resembled a mini gardener’s rake which was run across the page to produce parallel lines. 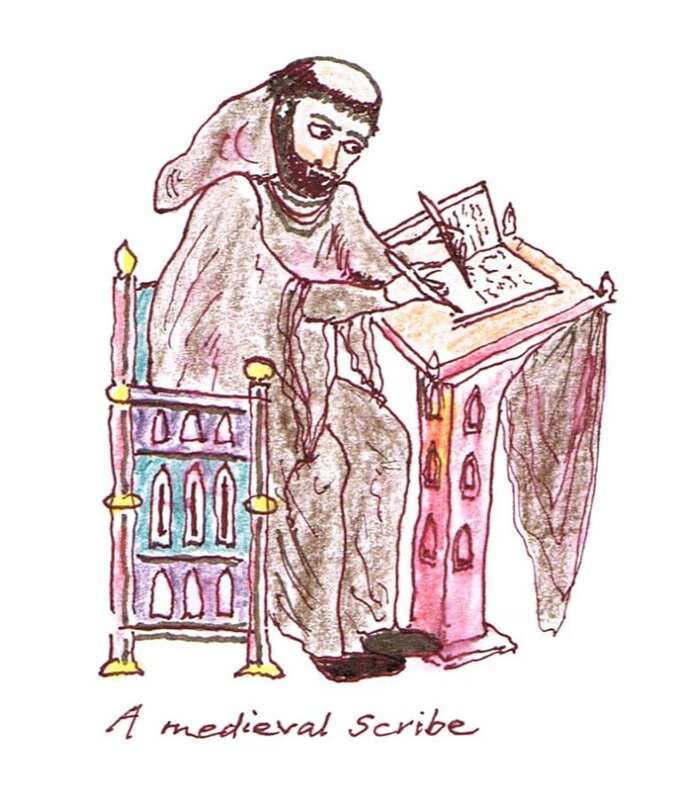 One can detect the use of the scribe’s rake in manuscripts whose lines quiver ‘in time’. Black ink had several sources. The dark natural colour from the glands of the cuttlefish was known since Antiquity; just as common was the carbon black ink made of crushed charcoal dissolved in water. But the material Medieval and Renaissance scribes favoured above all else was iron-gall ink. Its tendency to bond with parchment meant guaranteed durability and its lustre was irresistible. Its source was the tumour-like growth around the gall wasp (Biorhiza pallida) eggs laid in their hundreds in the buds or soft twigs of oak trees. The crushed galls, together with a little iron-salt, were boiled in rain water and the black liquid was thickened with gum-Arabic – the water-soluble sap of acacia or, more commonly in Northern Europe, cherry, plum or almond trees. The red ink used for titles, headings and important parts of the text was made from the roots of rose madder (Rubia tinctorum). Many colours, such as red, were cooked down with soft rain-water and fermented until the right colour was achieved. Blue was a very important colour because of its association with the purity of the Virgin Mary and artists would, if it was available and could be afforded, use lapis lazuli. When the stone was crushed to a fine powder and mixed with egg-yolk (tempera) it produced ultramarine. Instead, scribes would use a much cheaper alternative blue produced from woad (Isatis tinctorum). Yellow was often made with dried saffron crocus stimas, which produced a rich golden yellow and was sometimes substituted for gold. 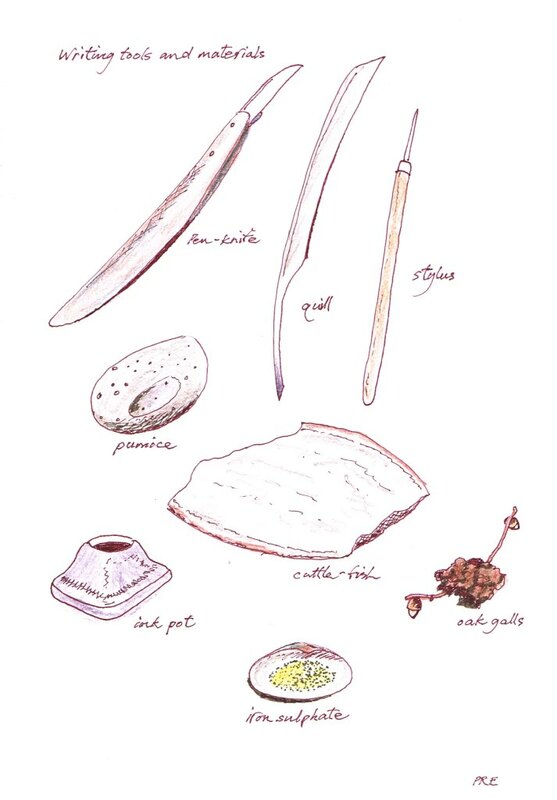 Scribes made their quills by cutting a goose, swan or rook feather with a pen-knife. The width of the nib determined the degree of contrast between pen strokes, thick or thin, according to the direction in which they were traced and also had a bearing on the scale of the writing. Smaller handwriting generally required a narrower nib. With the parchment, ink and quill ready, the scribe could start work on the text.